The new patent, published by the US Patent and Trademark Office on Thursday, details how built-in pressure sensors could be used together with touchscreen inputs to provide a better UI navigation experience. If that sounds similar to the last patent, it's because it is. 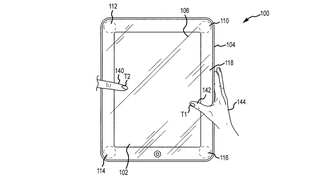 The patent—"Gesture and touch input detection through force sensing" to its friends—adds at least three force sensors beneath the standard multitouch display of an iPhone and iPad to act as a secondary mode of input. It suggests that they could be placed either under the screen or around the bezel of the device—as long as they were attached to the touch surface. In some embodiments, the force sensors are positioned outside of the active touch area. This may allow for a secondary mode of input that correlates to onscreen user interface elements like buttons or arrows. In such cases, required input for a UI graphic is offloaded beyond the border of a touchscreen's active surface, thereby freeing up much needed display space.